In our last blog post, we discussed how to design the ideal space for practicing piano. Now that you have your ideal piano practicing space, you can start to think about how to equip yourself with the tools to practice productively. Below are some tips and tricks to help you get the most out of your piano practicing habits. Once you’ve chosen the perfect space to place your piano, take some time to adjust the environment to be ideal for practice. Good lighting is commonly overlooked. You may be lucky enough to have a practice area that has natural light from a window. Still, we recommend using an additional piano lamp or standing lamp if the room doesn’t have ceiling lights. It’s important that you don’t strain your eyes while practicing by using dim lighting. When you practice, making sure to feel comfortable in every way possible can help free you from distraction. That includes keeping the temperature just right. The last things anyone wants while trying to focus on piano are sweaty palms or uncomfortably cold hands. Additionally, the piano also requires being kept at a comfortable temperature and humidity in order to stay in tune. If you find that your piano is going out of tune frequently, or if you just know that your home is particularly dry, it may be worth doing some research on a piano humidifier. This may seem very high maintenance at first, but remember, when treated correctly and with love a piano can survive for generations and decades of players to come. Nothing ruins a solid practice session like distraction. In our previous article How to Design the Ideal Practice Space for Learning Piano we mention the importance of distancing yourself from pets and roommates. But another the most common source of distraction is likely electronic devices. Phones can actually be useful during rehearsals. Dozens of music apps can aid your practice through metronomes, recording devices, and even PianoCub. The trick is to keep yourself free from the distraction of social media and incoming text messages. That’s why we recommend closing your social media apps and turning airplane mode on. There are countless apps out there that you may find helpful during practice. Just make sure to restrict the distracting power of non-piano-related apps during your practice session. · Clock - Keep track of how long you’ve been practicing on each particular section. It’s important not to overwhelm yourself and spend too long on any one problem when practicing. If you’ve spent more than 10 minutes on one section, take a break and work on another few measures for a while. You may find that giving yourself a break from a difficult section in your practice will help you feel refreshed when you approach that same section again. 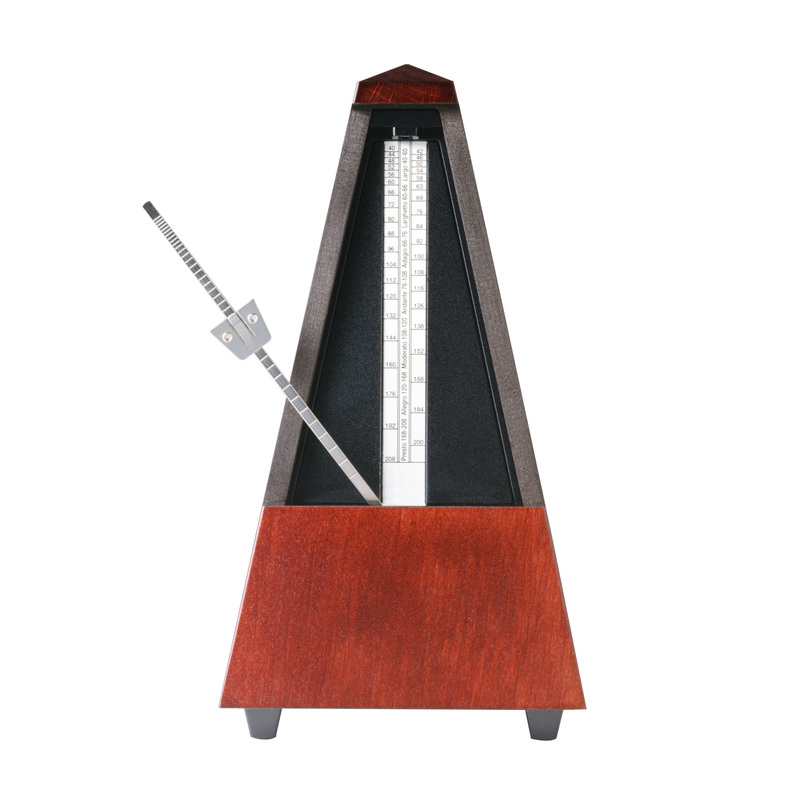 · Metronome - A metronome is an essential tool that helps keep your tempo while you practice. Remember, you should always start by setting your metronome to a tempo slower than the tempo of your piece. That way, you can make sure to play correctly at a slow speed before reaching your performance tempo. · Timer - A timer, similarly to a clock, can help you keep track of how long you spend on each section. If you give yourself an hour to practice but accidentally spend 45 minutes on warm-up activities, you probably haven’t made the best use of your time. Instead, set a timer when you begin a new section of your practice. For instance, set a specific time for your warm up, and each specific passage, like measures 60-65. Make sure to notice how much you progress during the short time limits. · Notebook - Keep a notebook in your piano bench or near your keyboard to keep track of your goals, progress, and homework for the next week. Studies show that when we write things down, our brains retain information better than without keeping a written record. You might also use the notebook to write down anything you’re feeling especially triumphant or frustrated over during a rehearsal. Then, when you return to the piano for your next practice, start by reviewing your feelings from last time. When you read about your last experiences it will transport you mentally back into a mindset where you are practicing and advancing your skills. · Pencils and sharpeners - Having a pencil and a pencil sharpener (or a mechanical pencil) at your piano at all times is vitally important. You must have a pencil handy in order to mark up your music with reminders and notes for yourself as you play. Notice, we do not recommend having an eraser around, and that is because the eraser shavings can sometimes get caught in the piano keys and damage the instrument. If you need to erase something, stand up from the piano and use an eraser nearby. Additionally, not having an eraser forces you to think more carefully before marking your paper, while also not having any fear of writing permanent markings. Set aside time to practice as though it’s a permanent part of your schedule. Would you miss an appointment if it meant you would lose money or miss out on a special date? Imagine that the stakes are at least that high when you miss a piano practice session. Set aside a time you know will work for you like “every Thursday at 4:00 PM while the kids are at soccer”. If you miss a practice session, again treat it like an important appointment. Even if you have to miss this Thursday at 4:00 PM because of dinner for your brother’s birthday, you can pencil in a make-up practice session at 10:00 AM Friday. Treating your practice routine like this will help solidify consistency in your practice routine. It will also show your family or anyone living with you that you’re serious about practicing and need the time and space to complete it.